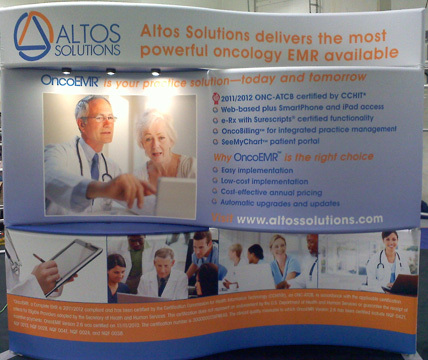 Signage for Altos Solutions‘ upcoming healthcare technology show…. Here’s an example of a simple, informative website which I created using WordPress, by customizing a fairly minimalist template. Other benefits of developing with WordPress are the CMS – content management system – so that clients can edit their content without knowing programming. And, WordPress is inherently built for optimal searches. More info at oncomet.com and by clicking on “blog banners & wordpress customizations” at left.